I am currently managing my trades. I haven't exited them because they haven't gone under the 20 day moving average yet. They've also stuck through the drop a couple weeks ago. However, yesterday they tested the 20 day moving average, but they are not oversold yet. In fact, they are just coming out of overbought. Could this be a sign for me to exit or will there be a bounce back up from the 20 day moving average? 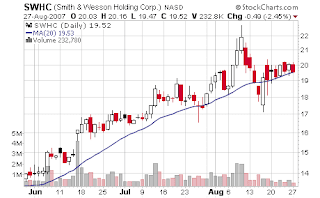 You can see by the below chart that one stock is nearing their 20 MA, but what isn't shown is that most of them are just getting out of their overbought territory. I will probably have to see what kind of situation the end of today brings and decide if I want go long term with these or not. I am also 100% in cash in my second brokerage account.